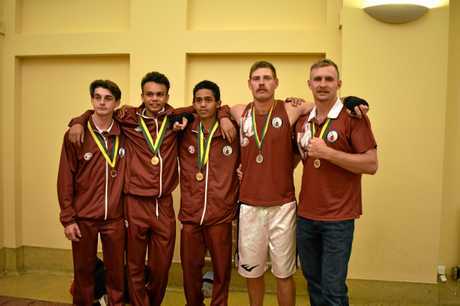 BOXING: Sizing up the competition at Tasmania's Australian National Boxing League Titles last weekend, Rockhampton Boxing Club knew they would deliver. However, they did better than they could have expected. 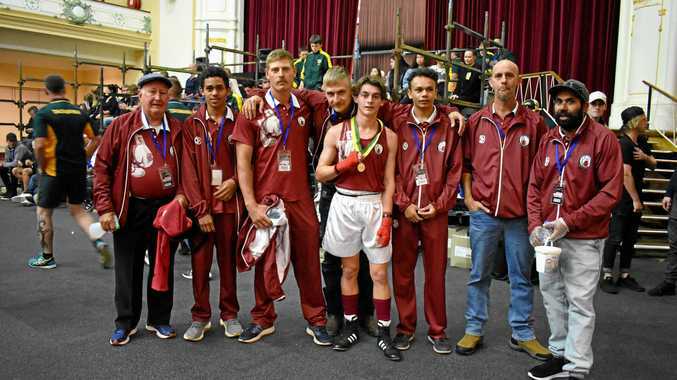 The event was held November 29 to December 1, with boxers from around the country battling it out in the snowy conditions of Tasmania. All five competitors, Drayden Marou, Sidney Booth, Blake Hughes, and seniors Michael Lynch and Lachlan Hinchcliffe, returned home with gold medals. Coach Des Upton said despite the stellar night, he was disappointed that Marou, 15, missed out on his chance to step in the ring. "He was supposed to compete Friday but the other bloke, New South Wales' Adam Zafir, pulled out so he got a walk over," Upton said. "Drayden stepped up from 54kg to 57kg division and got the gold. "He's in top form at the moment... He's always shown potential and he's very fast, elusive and can hit pretty hard. "If he keeps going, he's got a big future ahead of him." Booth, 17, fought T.L. Mach, and "put up a good show" despite being beaten on the Saturday night after stepping up from 51kg to the 57kg division. "Just giving away the weight sort of held Sidney back a bit," Upton said. "He tired a bit quickly and isn't the hardest trainer, but is a hard fighter and very elusive. "Once he puts his heart into it, he'll be right. "It was his first time fighting four two minute rounds." 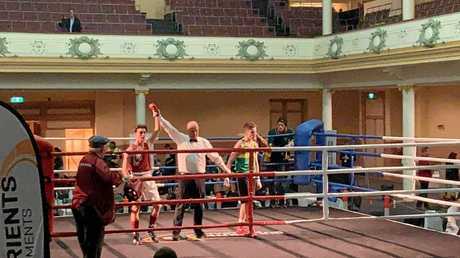 Hughes, 16, won his match against Jayden Tapp and delivered what Upton believed was his best fight yet. "Blake is really dedicated and trains hard and never takes a step backwards," he said. "He's a tough little fella and he wears too many punches, but that's just experience. "He cops a few but he's tough and keeps going after them and wears them down." Hinchcliffe, 26, competed in the 78kg division and easily defeated his opponent, Lincoln Reynolds. "He started off with me when he was 13," Upton said. "He gave it away for a while but came back in the last year. "He's always been good and is very strong and keeps himself in good condition. "He keeps at them all the time and doesn't get hit much. Reynolds didn't have an answer to him." Lynch, 26, otherwise known by Upton as "Mr Nice Guy" won his 81kg division against Tasmania's Ben Sammut. "He won every round of that," Upton said. "It was his first time in the Australian titles. He started out a few years ago and came back and done really well. "He's a good trainer and just keeps going. You don't have to tell him to do anything, he just gets in and does it." Upton said the annual titles provides a great opportunity for local boxers to develop their confidence, skill and allows them to see the standard of the country's competition. "It gives them a real boost," Upton said. "We've been going for a long time now. 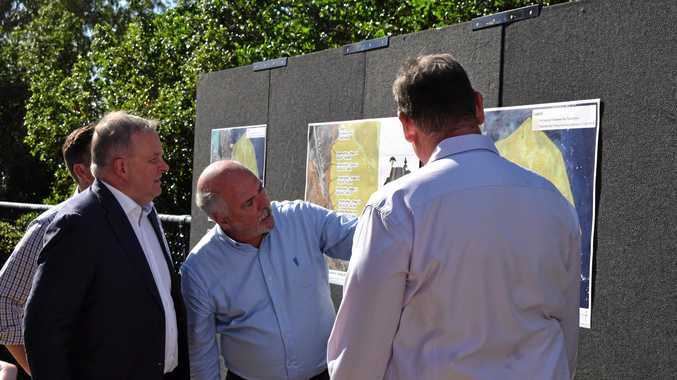 "Next year it will be held in NSW and then in Queensland the following year. "Boxing is hard yakka... but these blokes stuck in and were dedicated and looked forward to going down."